Shane Valentine is the author of The Baby Cuisine Cookbook , and part of the Food Revolution as it relates to preschoolers in America. 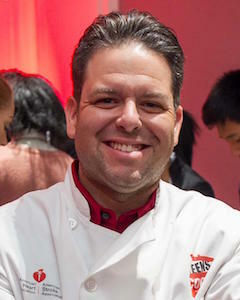 Known in food movement circles as the Jamie Oliver of the San Francisco Bay Area, Shane is on a mission to change the way children and their families view food in this country. Following up on the success of his first book “The Baby Cuisine Cookbook”, Shane has developed a groundbreaking program being dubbed “The Pre-School Food Revolution”, which teaches toddlers and preschoolers how to cook and where food comes from before they get to first grade. Nationally recognized author and pediatrician, Dr. Alan Greene (founder of drgreene.com & author Feeding Baby Green and Raising Baby Green) joined forces with Shane on this program. Shane is also a sought after speaker for corporations, non-profits, government agencies and universities. His “fire-side chat” titled “The State of Food” is an eye-opening look at the food our children are eating, from first foods to school age years. This multi-media presentation includes some incredible visual demonstrations of the salt, sugar and fats that are processed & packaged to kids in America. His no holds barred approach tackles the tough topics, such as the rising childhood obesity epidemic and its connection to enormous multi-national processed food companies & their deceptive marketing tactics. Shane then inspires his audience that “Today is a Brighter Day” and that in spite of all this, parents and the community at large can make some real changes that will have a profound impact on the future the minute they walk out of the auditorium. Shane lives in Marinwood with wife Chantal and three children; Alina 6, AJ 4 & Dario 4. Shane was recently awarded the American Heart Associations 2012-2013 Goal Impact Champion for his with AHA.